According to him, Sableye (makes sense with Mawile), Swampert (makes sense with Blaziken), Mew (makes sense with Mewtwo) and Garchomp (makes sense because GameFreak love Cynthia) will all be recieving Mega Evolutions. Along with Scizor he announced from a while ago. Personally I like all of these Pokemon and I am excited. This is a rumor so does it belongs in the Pokemon News' board? I'm leaving this here, since I can't find an actual source for the image and thus can be considered a rumor until then. 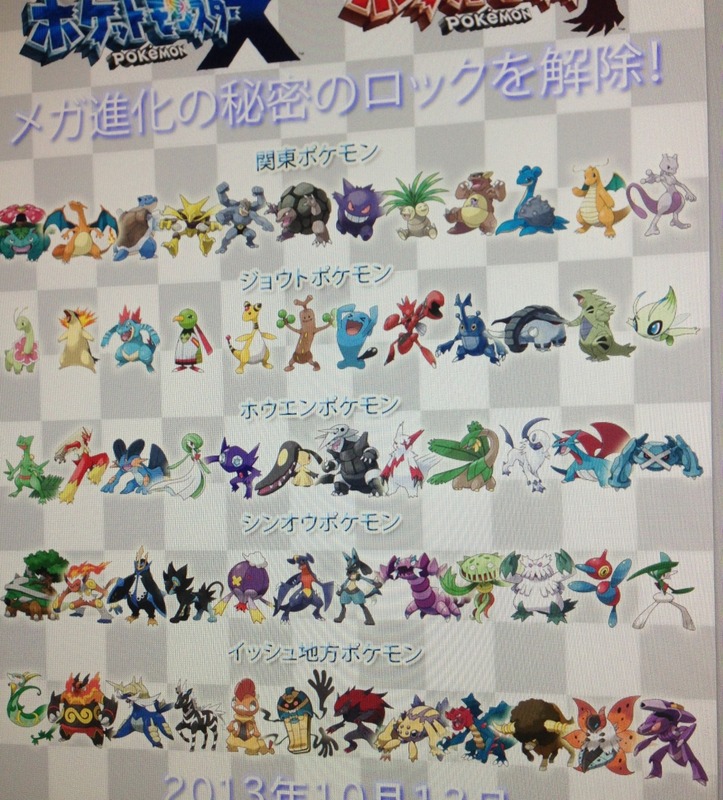 I am assuming it is from CoroCoro, but haven't found any proof that it is. List of all Mega Evolution Pokémon? I'm going for fake on this. Problem 1: Kanto is referred to as the actual Kanto region's name (関東, kanto), not its Pokémon name (カントー, kanto). Problem 2: Unova is the only one to include the word "region" (地方, chihou), but one of the characters was left off, instead meaning "ground" (地, ji). The text at the top is alright ("Unlock the secrets of mega evolution!" メガ進化の秘密のロックを解除！), but the verb is a little weird. Also, where's Kalos? I'm guessing how we've barely seen any final evolutions has something to do with that. Whether that is fake or not, it's a pretty good list. I wonde if we will actually get MegaDrifblim. Dreams really do come true~~~! ! ! ! ! ! In all seriousness, this list wouldn't really surprise me... What surprises me a bit is their mascot pokemon isn't on this list. I wouldn't be surprised if the Johto starters got mega-evos. I noticed how more final evolution starters were shown in trailers, such as Sceptile, Meganium, Typhlosion and Feraligatr. Last edited by Sub-zero; September 15, 2013 at 06:14:08 AM. I'm really excited to see what a mega infernape could look like. They could hold off on them though, after all Mega Formes are like any other formes so more could be added in extra versions or remakes. It'll probably become a gorilla with long hair. Legit enough. Edit: Wait, Mega Flygon gaiz! MEGA. FREAKIN. FLYGON. Last edited by Sub-zero; September 20, 2013 at 06:43:51 PM. Well the Kanto starters came true, and so did Garchomp.. It's a pretty interesting list, but I doubt ALL of those pokemon will be chosen for a mega evo.